Alpha Lambda Delta is a national honor society that recognizes excellent achievement in the first year of college. 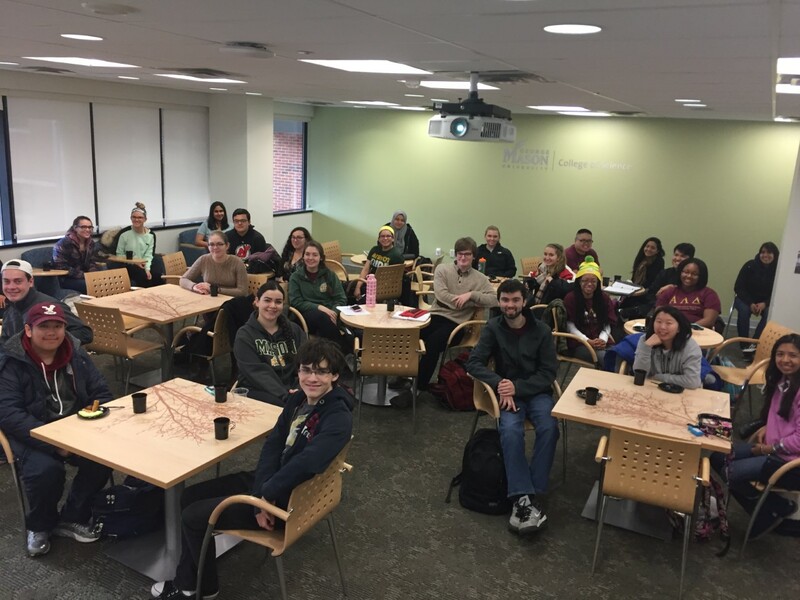 Students are invited to join in the spring semester of their first year of college if they achieve a cumulative GPA from the fall semester of 3.5 or higher at George Mason University. ALD members can earn 1 ALD hour for wearing their ALD t-shirts on the dates below! Students can purchase ALD shirts for $8 (exact cash only) by going to Exploratory Hall 1450 during regular business hours! Please talk to Zac Henderson. If you want to email him first to see if he's in, you can do so at [email protected]! On these days, a sign in sheet will be posted at Exploratory Hall room 1450. Come join us for our first meeting of the spring semester on Wednesday, Feb. 27! You can earn 1 ALD hour for coming to the meeting and an additional ALD hour for wearing your ALD t-shirt to the meeting since it's a t-shirt day! HOPE TO SEE YOU THERE! If you were inducted into ALD in the spring semester of 2018 (last spring), you are eligible to apply for the Trow Scholarship this year. 2. All applications must by typed - handwritten applications will not be considered. 3. Applications will be reviewed by the chapter's scholarship selection committee. 5. Official transcripts from each college and university attended. 6. Letters of recommendations from two references. 7. Applications must be submitted no later than 5 pm on March 18, 2019. Every Spring, Alpha Lambda Delta partners with the Fairfax County Animal Shelter to provide goods for their homeless animals. You can earn 1 ALD hour for every $3 you spend. This collection will end on MARCH 29. Please bring your donations to Exploratory Hall 1450 and check in with Zac Henderson. He'll take your receipt and will enter your hours for you. ALD members can earn 1 ALD hour for wearing their ALD t-shirts on the dates below! Students can purchase ALD shirts for $8 (exact cash only) by going to Exploratory Hall 1450 during regular business hours! Please talk to Allie Edwards. If you want to email her first to see if she's in, you can do so at [email protected]! Come join us for refreshments and fun as we head into the final month of the semester! We'll have some fun things to do and all you have to do is relax and enjoy the company of other ALD members. If you wear your ALD t-shirt to our event, you can earn an extra ALD hour (one for wearing your shirt and one for attending the event). Hope to see you there!!!! Every year, ALD collects non-perishable foods to donate to local food banks. This year, we are holding the food drive starting November 1. Please drop off things like canned foods, tuna, peanut butter, rice, dry beans, dry pastas to Exploratory Hall room 1450 between November 1 and November 30. You must sign in when you drop off the items. Please print your name and sign in the number of ALD hours based on how much you spent! For every $3 you spend, you can earn 1 ALD hour! Judy Nanaw (ALD president), and Samira Naeem (ALD VP) attended the National ALD Leadership Conference in Cincinnati, Ohio! They brought back lots of great info for our ALD members and would like to share it with you through a series of two workshops. The first workshop will be held on Tuesday, Nov. 13 from 430-530 in Expl. 3301. They will talk about how to best develop leadership skills and will provide lessons that will last a lifetime. Drinks and light refreshments will be provided. You can earn a total of 2 ALD hours by attending the event AND wearing your ALD t-shirt! Judy Nanaw (ALD president), and Samira Naeem (ALD VP) will hold their second workshop for ALD members where they discuss setting goals and keeping up with them. This information was shared at the National ALD Conference in October. Drinks and light refreshments will be provided. You can earn a total of 2 ALD hours by attending the event AND wearing your ALD t-shirt! Would you like to earn DOUBLE ALD hours to help out with an on-campus event? Please email Dean Fox if you are available to help for any period of time between 11am and 3 pm on Wednesday, September 5. We will be holding a large student event in Exploratory Hall that day and all volunteers will simply be helping to set up tables, man tables, and pass out goodies to students. For every hour you choose to work (1 hour minimum), you can earn 2 ALD hours for each hour! PLUS, if you wear your ALD t-shirt, you can earn an additional ALD hour. Interested in helping? Contact Dean Fox at [email protected] as soon as possible! Come join us for our first meeting of the fall semester on Wednesday, Sept. 19 in the Corner Pocket Game Room which is located in the HUB. We'll have great refreshments, and you'll have a chance to meet the new officers as well as mingle with the other members. Sept. 19 is also an ALD t-shirt day! If you wear your t-shirt on this day, you can either sign in at Exploratory Hall 1450 OR you can sign in when you arrive to the meeting. Hope to see you there! Come join us for our first meeting of the spring semester on Wednesday, January 31! We'll have plenty of food and drink, and we'll tell you more about our plans to participate in the National Science Festival in DC! You can earn 1 ALD hour for coming to the meeting and an additional ALD hour for wearing your ALD t-shirt to the meeting! HOPE TO SEE YOU THERE! If you were inducted into ALD in the spring semester of 2017 (last spring), you are eligible to apply for the Trow Scholarship this year. chapter's scholarship selection committee. The selected applications will then be forwarded to the National competition. 7. Applications must be submitted to Exploratory Hall 1450, no later than 5 pm on March 23, 2018. Every Spring, Alpha Lambda Delta partners with the Fairfax County Animal Shelter to provide goods for their homeless animals. You can earn 1 ALD hour for every $3 you spend. This collection will begin on FEBRUARY 1 and will end on MARCH 29. Please bring your donations to Exploratory Hall 1450 and check in with Allie Edwards. She'll take your receipt and will enter your hours for you. We will be representing George Mason University at the third national science festival to be held in Washington DC! If you would like to participate as an ALD member, you can earn 10 ALD points by traveling with us and sitting at the Mason table for one shift (3 hours). You can choose to participate on April 7 (Saturday) and/or April 8 (Sunday). ALD will provide metro transportation to and from the event for each day. If you would like more info about the festival, please go to usasciencefestival.org. Please email Allie Edwards at [email protected] if you would like to volunteer for a shift, travel with the other ALD members, and enjoy the event! Allie will keep a running list of those who are interested, and more detailed information will be provided to you prior to the actual event. Congratulations on your acceptance to the Alpha Lambda Delta Honor Society this year! We are excited to have you as a new member and look forward to seeing you at our next Induction Ceremony if you are able to attend. The ceremony will begin promptly at 1030 am in the Exploratory Hall Atrium. (This is where there are "periodic table" tables and a whale skeleton hanging from the ceiling!) For those who can attend, we ask that you arrive by 10 am to enjoy some refreshments prior to the actual event. You DO NOT have to be present to become a member of ALD, but it's nice if you want to be offiically welcomed! We ask that you RSVP to let us know that you'll be coming by writing to [email protected] All you need to do is include your name and a total number of people in your party. If it's just you, "1" is the right answer! If it's you and your parents, "3" is good. This will help us ensure we have enough seating for everyone! If you are not able to make the ceremony, NO WORRIES! Starting on Monday, April 16, you can stop by Exploratory Hall 1450 during regular business hours and obtain your certificate and pin. HOPE YOU CAN MAKE IT! PLEASE RSVP TO [email protected] to let us know your name and number in party. THANK YOU! CURRENT MEMBERS - Would you like to volunteer to help with our induction ceremony on Saturday, April 14? If so, please email Allie Edwards at [email protected] The volunteer time period is from 9 am to noon. You can earn 9 ALD hours for volunteering! If you wear your ALD t-shirt, we will up the total to 10 ALD hours! APPLY TO BECOME AN ALD OFFICER FOR 2018-2019! Join us for our final event for this academic year! Enjoy some tasty food, play a few quick games against your fellow members, relax with a coloring book, and more. You can earn 1 ALD hour for attending this event, and you can earn another ALD hour for wearing your ALD t-shirt! Don't forget to sign in when you arrive. HOPE TO SEE YOU THERE! Come join us for our end of the semester De-stress event on Dec. 6 (WED) from 330-430 in Exploratory Hall 3301! There are lots of fun activities planned including a fun trivia (with prizes! ), stress relieving coloring, and much more! Snacks and refreshments will be provided. You can earn 1 ALD hour just for stopping by and a total of 2 ALD hours if you also wear your ALD t-shirt to the event! VOLUNTEER AT OUR ALPHA LAMBDA DELTA TABLE! ​On Wednesday, September 6, there will be a festival/open house in Exploratory Hall from noon to 5 pm! We have reserved a table for ALD, and we are asking for volunteers to sit at the table during various times between noon and 5. If you are able to volunteer, please email Allie Edwards as soon as possible at [email protected], and let her know the time frame for which you can be present! Because of the short notice of this event, we are offering 3 ALD hours for every hour you volunteer to be at the table! We're hoping for many freshman to stop by to ask about ALD. Our volunteers will be giving out ALD pens and candy, as well as smiles and encouragement! Can you help out on Wednesday? Please email Allie ASAP! THANKS TO ALL VOLUNTEERS! - Toiletries - soap, shampoo, conditioner, razors, deodorant, toothpaste, etc. - Back-to-school supplies for all ages - pencils, pens, crayons, markers, calculators, glue sticks, etc. You will earn one ALD hour for every $3 you spend on the donations of these new items. We'll kick off this collection on SEPTEMBER 6 (Wednesday) which coincides with the Exploratory Hall Open House! The ALD Table and the Disaster Relief Table will be on the seconf floor of Exploratory Hall at the end that is right above the Atrium where the periodic table tables are located! There will be plenty of free pizza at that time as well, so please stop by! This collection will only run for ONE WEEK. If you cannot drop off your items to the Disaster Relief Table on SEPT. 6 from 12-5, you can drop off your items in Exploratory Hall 1450 from SEPT 7 through SEPT 14. We will be mailing these items over the following weekend to a registered charity in the local Houston area. If you would like ALD credit for your donation, please remember to SIGN IN on the ALD sheet and indicate the amount of money spent on your items. Thanks so much for your help. We give heartfelt thanks to all of the ALD members who generously supported our collection effort. Most of the collected items from the beginning of the collection time period were dropped off at Mason's LEAD office for transport with other University donations to Houston. Subsequent donations have been sent to the Virgin Islands Relief Fund. ALD made a cash donation of $250 to the United Way and another cash donation of $250 to the Humane Society to help with animal rescue as a result of both Hurricane Harvey and Irma. We are extremely proud of and grateful for our ALD members.Thank you. FIRST MEETING OF THE SEMESTER - SEPT 22; 3:30-4:30 PM in Expl Hall 3301! ​Please join us for our first meeting of this year! We will meet in Exploratory Hall 3301on SEPT. 22 from 3:30-4:30 pm. Come meet the new officers and mingle with the former officers and members! We will have plenty of food and drink. If you wear your ALD t-shirt, you can earn one ALD hour for attending the meeting plus one ALD hour for wearing your t-shirt to the meeting. Would you like to help pass out candy as a group to selected Faculty and Staff who support ALD???? We will start a list of volunteers to go out at 1030 am on TUESDAY, Oct. 31. If you are interested in participating, please email us at [email protected] to let us know. The group will meet at Exploratory Hall room 1450 to pick up the candy and the delivery list. They will leave promptly at 1030 with a list and candy. It's also an ALD t-shirt day! You can earn 2 ALD hours for making a group delivery, and you can earn another hour if you wear your ALD t-shirt or costume. So, you can earn up to 3 ALD hours for this event. It's a lot of fun and you only have to say "HAPPY HALLOWEEN." Believe me, it makes people happy. :-) Email at [email protected] A reminder will be sent a little later! ​Please join us for our second meeting! We will meet in Exploratory Hall 3301 from 330-430. Come meet the officers and members and bring your donations for the food drive! We will have plenty of food and drink to enjoy. If you wear your ALD t-shirt, you can earn one ALD hour for attending the meeting and one ALD hour for the t-shirt day. Every year, ALD collects non-perishable foods to donate to local food banks. This year, we will also collect non-perishable food items to donate to our own Patriot Pantry that helps our needy student population. The food drive will begin on NOVEMBER 1. Please drop off things like canned chicken, tuna, peanut butter, rice, dry beans, dry pastas, Granola bars, soups, pasta sauces, tuna with crackers, individual sized snacks and other non-perishable foods to Exploratory Hall room 1450 between Nov 1 - Nov 18. You must sign in when you drop off the items. Please print your name and sign in the number of ALD hours based on how much you spent! For every $3 you spend, you can earn 1 ALD hour! New members from the Spring 2017 invitation period will be inducted into the ALD Honor Society on APRIL 8 (Saturday) from 4-5 pm in Enterprise Hall Room 80. (Enterprise Hall has two parts that are separated by a breezeway. If your back is to the Johnson Center as you are approaching the main level of Enterprise Hall, please enter the glass doors to your RIGHT. Go down the stairs and you'll see Enterprise 80!). Please arrive by around 345 pm so that you can pick up your certificate and pin and then find a seat. We will begin the actual ceremony at 4 pm and it should take less than one hour. You are cordially invited to bring your family members with you! If you are not able to attend the ceremony on April 8, you are still considered to be a member! Be sure to pick up your certificate and pin from Exploratory Hall 1450 starting the Monday after the ceremony. Just ask Allie Edwards (our Associate Advisor) for these items. You can also purchase an ALD t-shirt from Allie for $8 (cash only please). PIZZA PARTY! Come join us for a slice of pizza and some camaraderie with other members! You can earn 1 ALD hour for attending and a second ALD hour if you wear your ALD t-shirt to the event! Hope to see you there! Lois Matteis is a student veteran at Mason, and she also works for a nonprofit called the Circle of Friends for American Homeless Veterans. ALD has agreed to assist her with a collect donated items that can be contributed to some of these shelters. You can earn ALD hours in two different ways. Second, you can earn ALD hours by volunteering to help with the collection on APRIL 21 (Friday). Lois needs volunteers to help between 8 am and 6 pm on that day. If you are interested in helping, please email Dr. Fox at [email protected] and indicate the time block that you would like to assist. Once we have the volunteer list finalized, we'll make sure Lois has a copy of it so she can have you sign in to earn your hours on that day. APPLY TO BECOME AN ALD OFFICER FOR 2017-2018! Please apply!!!! The rewards are great. ​Please join us for our first meeting of the semester! We'll have plenty of yummy goodies and drinks, and we'll talk about some ideas for the upcoming semester. All members are welcome to attend including brand new members who have just joined! We'll meet in Exploratory Hall 3301 at 330. HOPE TO SEE YOU SOON!!! Help us brighten the day of the many ALD supporters around campus! We will be delivering candy (as a group) to selected faculty and staff. The group will leave from Exploratory Hall 1450 at 1030 am and the delivery should take less than 1 hour. You will earn 1 ALD hour for participating with the delivery group. It's also an ALD t-shirt day, so you can earn another hour if you wear your ALD t-shirt! Alpha Lambda Delta is helping the Fairfax County Animal Shelter provide goods for their homeless animals. Sometime in the future, we're hoping to set up volunteer hours for our members by walking dogs and playing with their cats. But, for now, we are holding a collection to help these animals feel a little more loved! You can earn 1 ALD hour for every $3 you spend. This collection will end on MARCH 10. Please bring your donations to Exploratory Hall 1450 and check in with Allie Edwards. She'll take your receipt and will enter your hours for you. The Multicultural Association of Pre-health Students (MAPS) is holding a blood drive with the Red Cross in collaboration with many other great pre-health organizations on campus. This is a great opportunity for ALD members to donate blood and earn 3 ALD points for this event. Although walk-ins are allowed, depending on vacancy, it is better to register for an appointment online because it will save time and be more accurate. After you donate blood, please take your donation card to Exploratory Hall 1450 and show it to Allie Edwards so she can give you 3 ALD hours for donating. Please remember that a single blood donation can save up to 3 lives! Your gift matters! If you were inducted into ALD in the spring semester of 2016, you are eligible to apply for the Trow Scholarship this year. 7. Applications must be submitted to Dean Fox, Exploratory Hall 1450, no later than 5 pm on March 24, 2017. ​Please join us for our first meeting! We will meet in Exploratory Hall 3301 from 3-4 pm on Tuesday, October 18. Come meet the new officers and mingle with the former officers and members! We will have plenty of food and drink. It's an ALD t-shirt day as well, so you can earn one ALD hour for attending the meeting and one ALD hour for the t-shirt day. If you plan on coming to the meeting, you can sign in for t-shirt day at the same time instead of showing up earlier in Exploratory hall 1450! Would you like to help pass out candy as a group to selected Faculty and Staff who support ALD???? We will start a list of volunteers to go out at 1030 am on MONDAY, Oct. 31. If you are interested in participating, please email us at [email protected] to let us know. Every year, ALD collects non-perishable foods to donate to local food banks. This year, we are holding the food drive starting NOVEMBER 1. Please drop off things like canned foods, tuna, peanut butter, rice, dry beans, dry pastas to Exploratory Hall room 1450 between Nov 1 - Nov 18. You must sign in when you drop off the items. Please print your name and sign in the number of ALD hours based on how much you spent! For every $3 you spend, you can earn 1 ALD hour! ​Please join us for our second meeting! We will meet in Exploratory Hall 3301 from 7-8 pm on Wednesday, November 16. Come meet the officers and members and bring your donations for the food drive! We will have plenty of food and drink to enjoy. It's an ALD t-shirt day as well, so you can earn one ALD hour for attending the meeting and one ALD hour for the t-shirt day. If you plan on coming to the meeting, you can sign in for the t-shirt day at the same time instead of showing up earlier in Exploratory hall 1450! LAST GET-TOGETHER FOR THE FALL SEMESTER! Come join us for our end of the semester De-stress event on December 12 from 5:30PM to 7:30 PMin EXPL 3301. There are lots of fun activities planned including a fun trivia (with prizes! hint! hint! ), stress relieving coloring, and much more! Snacks and refreshments will be provided. You can earn 1 ALD hour just for stopping by and a total of 2 ALD hours if you also wear your ALD t-shirt to the event! DID YOU MISS THE INDUCTION CEREMONY? ALD members can earn 1 ALD hour for wearing their ALD t-shirts on the dates below! Students can purchase ALD shirts for $8 (exact change or check) by going to Exploratory Hall 1200 (Biology Office) during regular business hours AND ONLY ON THE DESIGNATED T-SHIRT DAYS SHOWN! Please talk to JOANNE ZIMMERMAN who is an ALD Honorary Member! On these days, a sign in sheet will be posted at Exploratory Hall room 1200 (biology office). Our co-advisor, Joanne Andersen Zimmerman, will be there! LAST GET-TOGETHER FOR THE ACADEMIC YEAR! Come join us for our end of the year De-stress event on May 3rd from 4:30PM to 5:30PM in EXPL 3301. There are lots of fun activities planned including a fun trivia (with prizes! hint! hint! ), stress relieving coloring, origami folding, and much more! Snacks and refreshments will be provided. You can earn 1 ALD hour just for stopping by and a total of 2 ALD hours if you also wear your ALD t-shirt to the event! Come join us for a beautiful Friday afternoon to help tidy up the area around Mason Pond! You will earn 2 ALD points for the one-hour cleanup, and an extra point if you wear your ALD T-shirt. We will be meeting at 3:30 this Friday in front of the benches at Mason Pond. Be sure to check in with ALD Officer Jonathan Reed so you can get ALD credit! USA SCIENCE AND ENGINEERING FESTIVAL DC! We will be representing George Mason University at the second national science festival to be held in Washington DC! If you would like to particpate as an ALD member, you can earn 10 ALD points by traveling with us and sitting at the Mason table for one shift (3 hours). You can choose to participate on April 16 (Saturday) and/or April 17 (Sunday). ALD will provide metro transportation to and from the event for each day. If you would like more info about the festival, please go to usasciencefestival.org. Please email Dean Fox at [email protected] if you would like to volunteer for a shift, travel with the other ALD members, and enjoy the event! ALD will be collecting non-perishable foods to donate to Food for Others, a local food bank in Fairfax. You can drop off your donations to Exploratory Hall 1200 (biology office) starting on March 21. Please be sure to sign the sign-in sheet in order to earn ALD credit! You can earn 1 ALD hour for every $3 you spend. The 2016 Induction Ceremony will be held on APRIL 2 (Saturday) from 130 to 3pm at the Global Center (formerly the Mason Inn) located on the Fairfax Campus! All new members are welcome to attend, and we ask that you email us at [email protected] to let us know approximately how many people will be attending with you. If you will not be able to attend, it's not a problem, and just let us know that, too. Starting on the following Monday (April 4), you will be able to pick up your certificate in Exploratory Hall 1450 during regular business hours. Join us for our second spring meeting! Just come to Exploratory Hall 3301 starting at 430 pm. You will earn 1 ALD hour for attending the 1 hour meeting, and you can earn an additional ALD hour if you wear your ALD t-shirt to the event! We will have plenty of great food and drinks to offer. Come join us! If you were inducted into ALD in the spring semester of 2015, you are eligible to apply for the Trow Scholarship this year. 7. Applications must be submitted to Dean Fox, Exploratory Hall 1450, no later than 5 pm on March 18, 2016. Join us for our first spring meeting! Just come to Exploratory Hall 3301 starting at 630 pm. You will earn 1 ALD hour for attending the 1 hour meeting, and you can earn an additional ALD hour if you wear your ALD t-shirt! We will have plenty of great food and drinks to offer. Come join us! Help us brighten the day of the many ALD supporters around campus! We will be delivering candy (as a group) to selected faculty and staff. We will have two different delivery groups, but both will pick up the goodies and the list of recipients at Exploratory Hall 1200 on February 12 (Friday). There will be a group that leaves there at 11 am and one that leaves at 130 pm. The deliveries should take less than 1 hour. You will earn 1 ALD hour for each delivery you participate in. It's also an ALD t-shirt day, so you can earn another hour if you wear your ALD t-shirt! ALD members can earn 1 ALD hour for wearing their ALD t-shirts on the dates below! Students can purchase ALD shirts for $8 (exact change or check) by going to Exploratory Hall 1200 (Biology Office) during regular business hours AND ONLY ON THE DESIGNATED T-SHIRT DAYS SHOWN! Please talk to REBEKAH FLIS who is an ALD Advisor! On these days, a sign in sheet will be posted at Exploratory Hall room 1200 (biology office). Our co-advisors, Joanne Zimmerman and/or Rebekah Flis, will be there! Every year, ALD collects non-perishable foods to donate to local food banks. This year, we are holding the food drive starting NOVEMBER 2. Please drop off things like canned foods, tuna, peanut butter, rice, dry beans, dry pastas to Exploratory Hall room 1200 (Biology Office) between Nov 2 - Nov 24. You must sign in when you drop off the items. Please print your name and sign in the number of ALD hours based on how much you spent! For every $3 you spend, you can earn 1 ALD hour! Join us for our first membership meeting for the year! Meet some of your advisors and your brand new officers. We'll have plenty of refreshments and a short activity to get you started. This event is scheduled on an ALD t-shirt day, so you can earn 1 ALD hour for attending the event and also 1 ALD hour for signing in with your t-shirt on! If you plan to come to this meeting, you don't need to sign in at the biology office. Would you like to help pass out candy as a group to selected Faculty and Staff who support ALD???? We will start a list of volunteers to go out at 1030 am on FRIDAY, Oct. 30, and noon on the same day. If you are interested in participating, please email us at [email protected] to let us know which time(s) to put you down for. The group will meet at Exploratory Hall room 1200 (Biology office) to pick up the candy and the delivery list. They will leave promptly at 1030 and, again, at noon with a list and candy. If you wear your ALD t-shirt or a Halloween costume that day, you will earn 1 ALD hour. You can also earn 1 ALD hour for a delivery time! So, you can earn up to 3 ALD hours for this event if you do both deliveries! It's a lot of fun and you only have to say "HAPPY HALLOWEEN." Believe me, it makes people happy. :-) Email at [email protected] A reminder will be sent a little later! Join us for our second fall membership meeting on Monday, Nov. 9 at 630 pm in Exploratory Hall 3301. We will have plenty of refreshments and an activity for you to participate in! Come join us for an hour to earn 1 ALD hour. If you wear your ALD t-shirt to the event, you can also earn an extra ALD hour for doing so! The American Red Cross will be on campus for a blood drive between 1030 and 3 on Nov. 12. If you would like to donate blood, please stop by the HUB Ballroom. You can earn 2 ALD hours for donating blood on campus for this particular campaign. After donating blood, you'll receive a paper that identifies your donation. Please take it to Rebekah Flis (in the biology office; Exploratory Hall 1200) and she will record your hours for us. WELCOME TO NEW MEMBERS! Be sure to read the FAQs for more information about our Mason Chapter of Alpha Lambda Delta! You are welcome to participate in all of our upcoming events! The College of Science has asked for volunteers to help with their convocation on May 13 (Wednesday) from 10 am to 2 pm! If you are available and would like to help, you can earn triple ALD hours for your assistance! If you wear your ALD t-shirt and work for the entire time period, you can earn 13 ALD hours. If you are interested, please email Dean Fox as [email protected] to volunteer. On APRIL 9, members of the Mason Community will participate in the Displacment Day event on the EAST PLAZA from 9 am to 5 pm. This event is designed to bring awareness of displaced populations around the world and the many challenges they face. ALD will have 2-3 shelters specifically for them so that they can share the experience with other ALD members and officers. If you would like to participate in this event, you will need to sign in and out with an ALD officer. (All earned hours must be on a sign-in sheet). You can earn up to 5 ALD hours for this event and credit will be given on an hour-to-hour basis. Please contact Mai Nguyen ([email protected]) for more information and to find out where the ALD shelters will be located! On these days, a sign in sheet will be posted at Exploratory Hall room 1200 (biology office). Our co-advisors, Joanne Andersen Zimmerman and/or Rebekah Flis, will be there! If you would like to help, please take your purchased items and your sales receipt to Exploratory Hall 1200. You can earn 1 ALD hour for every $3 you spend. More importantly, you will know that you are making a positive impact on someone who is truly in need of help on campus. Thanks to all of you for caring. April 21 at 130 pm in the HUB Ballroom. Help us brighten the day of the many ALD supporters around campus! We will be delivering candy (as a group) to selected faculty and staff. We will have two different delivery groups, but both will pick up the goodies and the list of recipients at Exploratory Hall 1200 on February 13 (Friday). There will be a group that leaves there at 11 am and one that leaves at 130 pm. The deliveries should take less than 1 hour. You will earn 1 ALD hour for each delivery you participate in. It's also an ALD t-shirt day, so you can earn another hour if you wear your ALD t-shirt! Join us for our first spring meeting! Just come to Exploratory Hall 3301 starting at 430 pm. You will earn 1 ALD hour for attending the 1 hour meeting, and you can earn an additional ALD hour if you wear your ALD t-shirt to the event! We will have plenty of great food and drinks to offer. Come join us! Membership is $60 and is good for a lifetime! A portion of these funds go to the National Office and the remainder stays with our local chapter. The local chapter dues pay for chapter operating expenses (mailings, refreshments, service projects, local scholarships, induction ceremony, etc.). The national dues cover the cost of your membership certificate, a charm or lapel pin, and a copy of the national magazine, The Flame. In addition, you are eligible to compete for 32 undergraduate scholarships of $1000 and 23 graduate fellowships of $3000-$7500. The national dues also cover the cost of an annual leadership/activities workshop. No. Although Alpha Lambda Delta encourages academic excellence throughout your collegiate career, once you have met the criteria for membership in Alpha Lambda Delta and have been initiated, your membership cannot be taken away. If your cumulative GPA falls below 3.5, you will just not be eligible to apply for any scholarships. In 2004, the National Council approved a change in the bylaws allowing chapters to remove from membership any members who had been found in violation of their school's academic honesty policy. Can I join both Alpha Lambda Delta and other honor societies? What's the difference? There is no conflict between membership in Alpha Lambda Delta and other honor societies; in fact, joining more than one will give you greater scholarship opportunities. Honor societies often offer undergraduate scholarships and graduate fellowships. If I don't join Alpha Lambda Delta this year, will I be invited again next year if my GPA is still 3.50 or above? No, students are only eligible for invitation once. If the invitation is not accepted when offered, it is not extended again. None! We understand that many students already have a very full schedule. However, students who participate/donate at least 24 “ALD-eligible” hours will be awarded graduation cords upon completion of their volunteer efforts. Students can accumulate “ALD hours” from the time they are inducted until they graduate. Dr. Donna M. Fox is the primary faculty advisor. The current ALD officers are shown on the ALD home page. No! Alpha Lambda Delta respects your privacy - we will never sell your private information to or share your private information with any third parties. The National Office does not retain any of your personal information in our files.